"'No; I am Kim. This is the great world, and I am only Kim. Who is Kim?' He considered his own identity, a thing he had never done before, till his head swam. He was one insignificant person in all this roaring whirl of India, going southward to he knew not what fate." I grew up on Disney's The Jungle Book - talking snakes, marching elephants, dancing bears, and harmonizing vultures singing Beetle-like tunes. What's not to love? Although the story was loosely based on Rudyard Kipling's book, I have to wonder what Kipling himself would have thought of Walt Disney's version. My exposure to Kipling's works was basically limited to the Jungle Book (in the form of children's literature and films ) and watching a young Sean Connery, Michael Caine, and Christopher Plummer in The Man Who Would Be King . As an aside: if you haven't watched that movie, I suggest that you do. I have always found it interesting to watch. 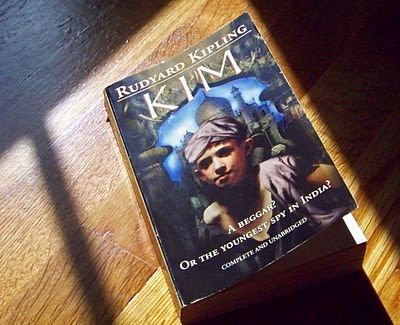 Since I have read several books based on India and Indian culture in the last few months, I decided it was time to read the adult version of a Kipling book, and I chose Kim . I won't lie: I had a hard time getting lost in this book. It felt more like I was reading an assignment for school rather than a chosen book for pleasure. However, there were some highlights that stood out to me - more paragraphs (like the one at the top or this one below) than actual plot. I liked the ideas because they rang true to me. I understood the sentiment behind, "I am only Kim. And who is Kim?". In the last year of personal growth, knowledge and learning have become more important to me than in all the years of my official education, so the whole idea of "it seemed that the more a man knew the better for him" hit home. I didn't know much about Rudyard Kipling (and still don't know a lot), other than the fact that he was a British citizen who spent most of his life in the highways and byways of India. 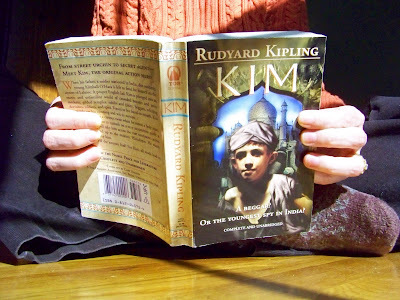 The forward of Kim - written by Eileen Charbonneau - gives some additional insights into who Kipling was and how he felt about the natives of the land that he loved and the politics that eventually gave them their freedom. Much of what he said or did would be taken as racist in this day and age, but as Charbonneau points out, he was merely following the common thought of the day. At the same time, in characters like Mowgli and Kim, we see a softer side to Kipling as he was a champion for those who had no one to defend or care for them. "Many years ago Rudyard Kipling gave an address at McGill University in Montreal. He said one striking thing which deserves to be remembered. Warning the students against an over-concern for money, or position, or glory, he said: 'Some day you will meet a man who cares for none of these things. Then you will know how poor you are.'" Many of the characters in his book, including those in Kim (like the lama) are examples of this and I think it's something to bear in mind as we move forward in the world. It really doesn't matter how much you save at the grocery if you're stingy with what you have. It's not about the job title, it's about how well you do the work you are given. Do you care more about getting the glory or having the personal satisfaction of seeing a completed task? It's about learning satisfaction in the small things, which is one of the main points of Kim and one of the reasons that this book won't be going to the used bookstore. 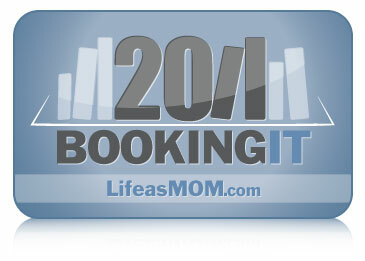 I'll be linking up to the Life as MOM "Booking It" review on February 11th, so make sure you check back to see what other people thought of their book choices on February 10th and 11th. If you would like to read my reviews of other books I read in January, you can find them HERE and HERE. Thanks for stopping by and Happy Reading! Jungle Book was probably my favorite Disney movie growing up!! I even had the RECORD (which I played on my fisher price record player - yes, I'm that old). I haven't ever read any Rudyard Kipling. But I'm super curious about Indian culture... so maybe I'll add it to the old "to be read" list.